In all the hubbub surrounding the excellent new calibers we have today, the fact is the cartridges we’ve known and loved for decades haven’t become any less effective. And Hornady recognizes that not everyone is going to shove a trusted rifle in the corner to go buy the latest and greatest. 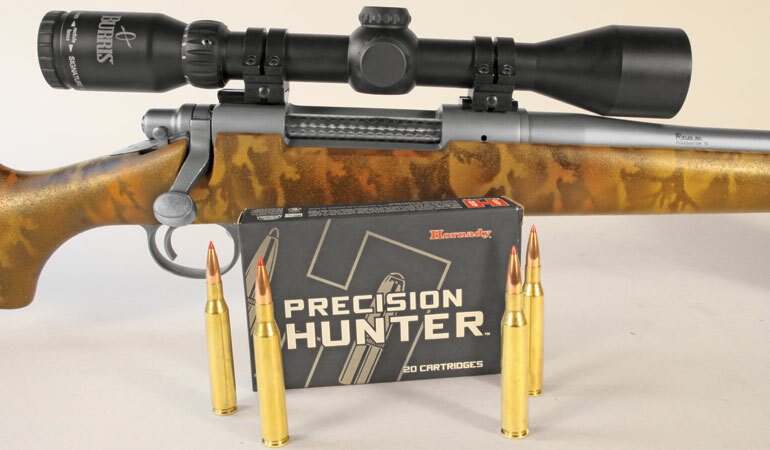 The .25-06 Rem., a go-to caliber for tons of hunters and certainly for me, is a case in point. The new load features a 110-grain ELD-X bullet with a G1 ballistic coefficient of .465 (G7 is .234). Between the terrific BC and the bullet’s Heat Shield tip that resists deformation due to friction-based heat, the ELD-X boosts downrange performance. Further, it’s specially designed to work across the velocity spectrum—no small feat when you’re talking about a screaming fast round like the .25-06. I tested it out of one of my all-time favorite rifles, a Rifle’s Inc. Strata with a 24-inch Lilja barrel. The load churned up 3,095 fps, with an excellent 14.0 standard deviation. It wasn’t quite as accurate as my pet load—Winchester’s 115-grain Ballistic Silvertip—but it averaged 1.12 inches for four three-shot groups. With loads it likes, this rifle is capable of half-minute accuracy. However, secant-ogive bullets like the ELD-X can be fussy about seating depth; some rifles are going to shoot them better than others.